The Big Poetry Giveaway: HAS BEGUN! Be part of it! So it's that time again-- National Poetry Month is around the corner and for those of us who love poetry, poets, and their books, it's time for us to share our favorite books (and our own books) with you. This is our third annual National Poetry Month BIG POETRY GIVEAWAY. Anyone with a blog can giveaway 2 books of poems. Anyone can enter any or all of the giveaways. Yes, poetry is that easy! 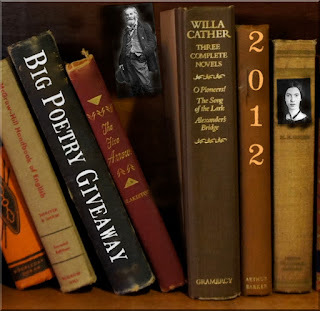 What is the BIG POETRY GIVEAWAY-- Bloggers give away 2 books of poems-- the first can be your own & the second book must be of another favorite poet of yours. The goal is to share our favorite poets with others as well as to visit different blogs and see who others are reading. 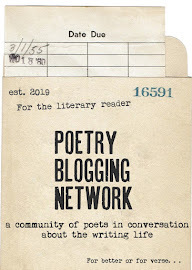 There is also a benefit for those who participate as it will bring people to your blog and share your work and/or the work of a favorite poet with them. I'll keep a list of all the blogs participating on this post and to the left side of my blog. The Poetry Book Giveaway is officially started and the giveaway will run through April 30th (all of National Poetry Month). 1) Create a blog post that includes the above image (so we know you're participating) that announces the two poetry books you are giving away. Somewhere in your blog post, you can include a link to this page, in case others have questions or want to participate. I will keep a running list on the side of my blog as well as on this post (note: the side list will be the most up-to-date, I'll update this list every few days). Then sometime in the week of May 1st, 2012, choose 2 winners for your giveaway. **** If you are participating in this giveaway, you must be willing to mail 2 separate books of poems to ANYWHERE in the world. You pay for the postage, the winner DOES NOT. 1) Can I enter the drawing if I don't participate in the giveaway? Yes, the drawings are open to anyone. 2) Can I enter the drawings if I am a blogger giving away two books? Yes, again, the drawings are open to anyone. 3) Can the two books I give away both by written by me? No. One book in your giveaway must be by another poet, specifically one of your favorite poets. 4) Can I give away two books that I wrote and one book from someone else? Yes! You can give away as many of your own books as you like as long as you make sure to give away a book by someone else. You are also welcome to give away a subscription to a favorite literary journal as an extra prize if you like, but again, you cover the cost. 5) I'm not a blogger, but can I participate? No & Yes. You cannot participate in giving away 2 books of poems, but you can enter to win books in the giveaways. 6) Do the books I give away have to be new? No. But only give away gently-used books. They should look newish (and smell newish). 7) I'm not a poet, but I love poetry can I participate in the giveaway? Yes! Just give away books by two of your favorite poets. 8) I'm a poet, but only have a chapbook, does that count as a book? Yes! Chapbooks are books! Feel free to give away your chapbook and then another collection by a favorite poet. 9) I don't want to pay postage if someone wins. Can I still participate? 10) Do I need to have a blog to enter for the drawings? This is completely up to the blogger who hosts the drawing you sign up for. When I did it for last year, I allowed readers without blogs to sign up but only if they include their email so I could get ahold of them if they won. 11) If I don't have a blog and I sign up for a drawing, how will the blogger contact me? Make sure to leave your name and email address! 12) How long will you be accepting posts/links for the giveaway? All emails with your blog name, your full name & a link to your blog giveaway MUST be emailed to me by midnight PST, April 10, 2012, if you want to participate. 13) What are the exact dates of this giveaway? The giveaway begins immediately. And you can enter someone's contest as SOON as a blogger posts their giveaway. The giveaway ends April 30th, 2012 at midnight (PST or Hawaii-time, not sooner). The winners will be chosen the week of May 1st, depending on the blogger's schedule. 14) How will I know if I've won? A blogger will contact you probably by email to let you know and will then ask for your mailing address to mail the book out to you. 15) Where's THE LIST of all the blogs giving away books of poems? On the left side of this blog. 16) This is becoming an annual thing, why do you do this each year? Because I want to introduce people to poets they may not have heard of. Because I want more people to read poetry. Because I love the idea of poetry books being mailed off to new readers. Because I like learning about new blogs and bloggers. Because it's National Poetry Month and I want to bring more attention to poets and poetry. Kathleen Kirk: Wait! I Have a Blog?! Allyson Whipple: How Can the Poet Be Called Unlucky? Donna Vorreyer: Put Words Together. Make Meaning. www.BananaBigTime.com - Unique poems and drawings by Ken Higginson. I am so excited to do this again! So much fun! Thanks Kelli for setting this up again--it's such a great idea for poetry exchanging. I didn't want to be one of the last ones in again, so this year I am jumping in early. Also posting on Facebook--glad you liked the suggestion! I am hosting another giveaway this year! Blog Title: How Can the Poet Be Called Unlucky? Thank you for organizing this again! Hi Kelli, thanks for organizing this! Hi Kelli! Thank you so much for including my book as one of your giveaways! I'd like to participate, too. 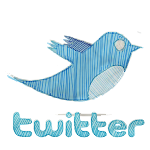 My name (owner of the blog) is Jessica Goodfellow. Rats! Life got away from me this year and I didn't sign up in time! Thanks to all who did and are keeping this wonderful tradition alive. Sorry I missed it! I hope you'll do this again. 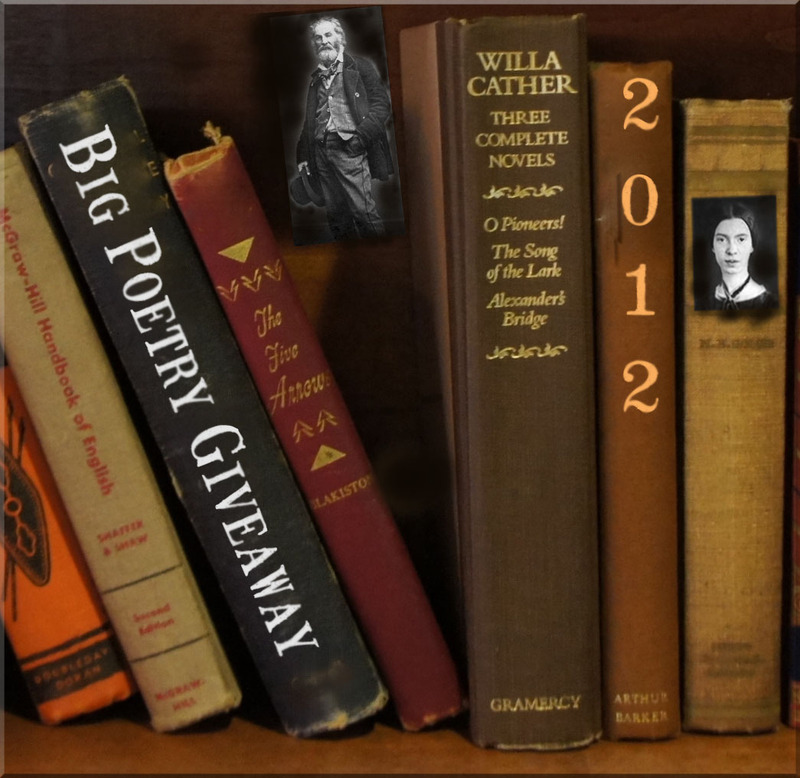 Big Poetry Giveaway 2012....Are you ready, Poets?